Why would Jesus tell the disciples to bring swords and then rebuke Peter for using one? Q. 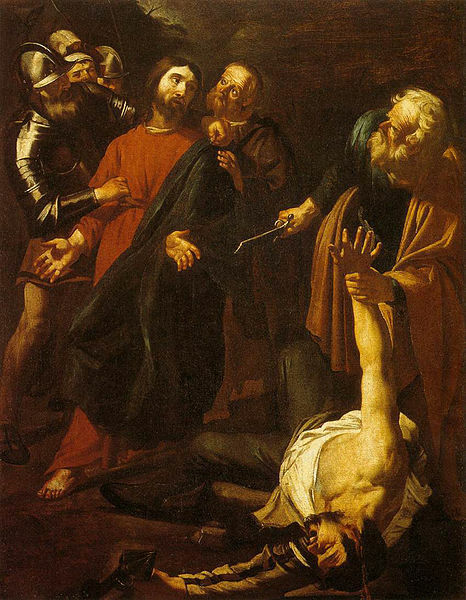 Why do you suppose Jesus would tell the disciples to bring swords, and then they do, and then Peter cuts off someone’s ear, and then Jesus clearly thought that was a dumb move, and heals the guy? It seems like a weird sequence of events. However, there are other contexts that are very unfavorable, indeed hostile, to the life and witness of the community of Jesus’ followers. In those contexts, it shouldn’t expect the support of outsiders. It has to supply its own provisions and it also needs to be prepared to defend and protect its members by reasonable means and precautions. I think it’s significant that when the disciples reply to Jesus at the Last Supper, “Look, Lord, we have two swords among us,” he answers, “That’s enough.” Many biblical interpreters believe that Jesus is saying it’s all right for the disciples to have some weapons as a deterrent and basic protection in a hostile environment. However, in the Garden of Gesthemane, Peter moves from defense to offense by attacking first. He also does this in a situation where the disciples are outnumbered and much less well armed than their opponents. Jesus rebukes him and heals the man he injured, in order to prevent a bloodbath. So it appears that while the community of Jesus’ followers can adopt basic protections and precautions, when it encounters an overwhelming force bent on doing harm, its response must not be to fight to the last one standing, but to be willing to accept suffering as the means of continuing its witness. Dirck van Baburen, “The Arrest of Christ,” depicting the episode in which Peter strikes with his sword. Previous Previous post: Doesn’t the Bible teach election based on God’s foreknowledge? Next Next post: Was Acts really written around 150 AD?